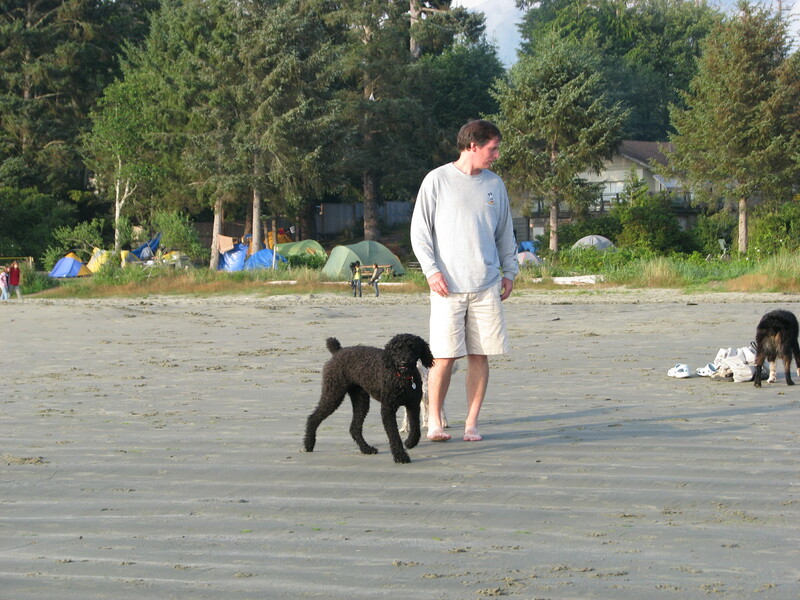 Bella Pacifica Campground is located just minutes outside of Tofino on Mackenzie Beach. It offers walk-out beach front sites, ocean view sites, as well as forested sites. Tofino is a 3 hour drive from Nanaimo and 5 hours from Victoria, but it is well worth the trip. This scenic town is located near Long Beach and the Pacific Rim National Park. 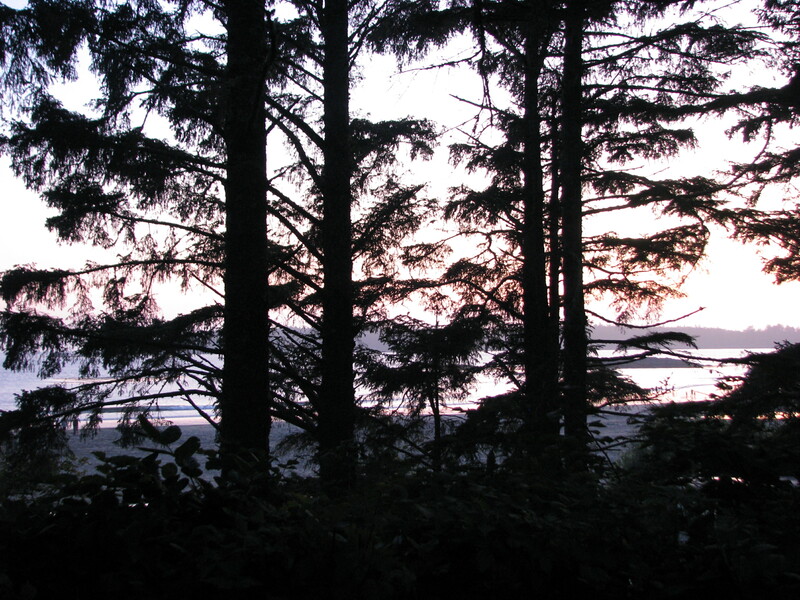 The area is know for its great surfing, pristine beaches, old growth forest, whale watching and spectacular hiking. 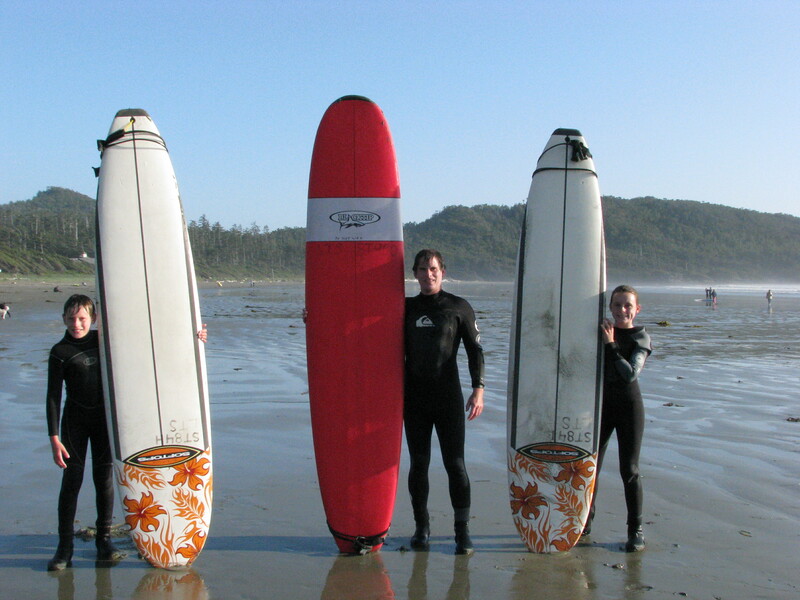 If you are looking for a trip the exemplifies the “Great BC Outdoors” then Tofino has it all. 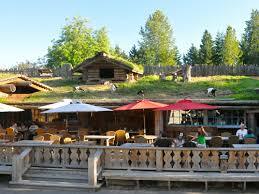 The small town of Tofino also offers several great restaurants, local shops and guided tour operators. 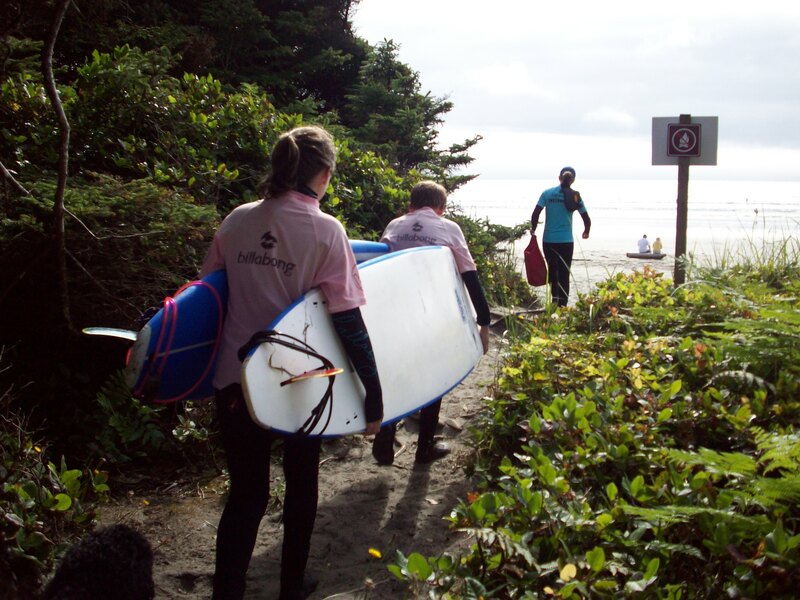 Whale watching tours, surfing lessons, kayaking excursions, fishing expeditions and hiking treks can all be booked through local operators on the streets of Tofino, or booked online ahead of time.My thoughts in the campground. Recommended Sites: You are coming here for the ocean, so get a site that gives you a view of it. Yes, you will give up some privacy but it is worth it. The views, ocean air and sound of waves cannot be missed. If you have a smaller trailer (under 18 feet) try to get one of the beachfront sites (1-18). This is not easy to do but try, even if you have to move sites part way through your stay or adjust your dates accordingly. If that is not possible then get a Terrace View (sites 19-33) or if tenting (sites area 56-109) but try to get a site on the ocean side. The forest loop sites are nice and very private but you cannot compare them to the spectacular ocean view sites. These sites are very hard to get and we had to spend a couple nights in a non-view site before we could get to an ocean view. 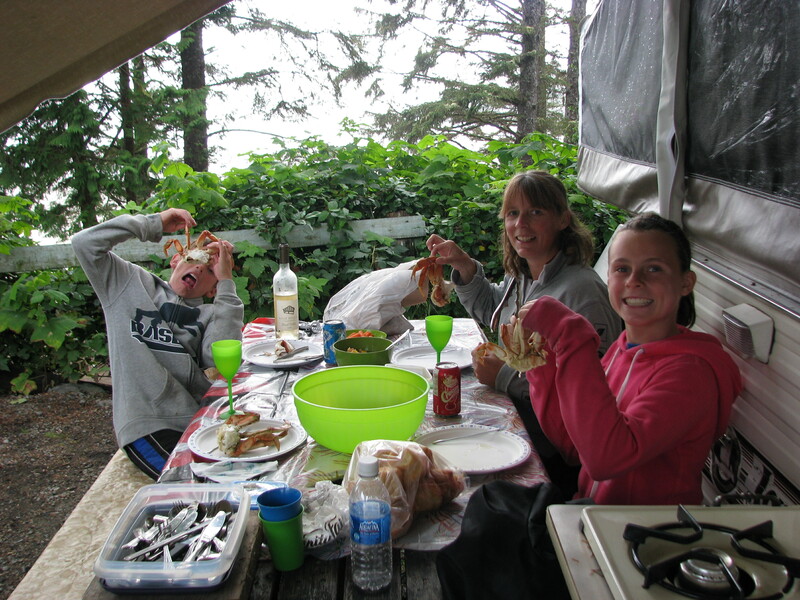 You may think it is not worth the effort to move mid camp but let me tell you a local crab dinner with a bottle of BC wine while over looking the ocean will make you forget any inconvenience you may have experienced. Location, Location, Location – it is on one of the most beautiful beaches anywhere. View Sites – do what you can to get one. On site laundry, it is very damp and you will appreciate the dryer. Be prepared to get sand all inside of your RV, trailer or tent! 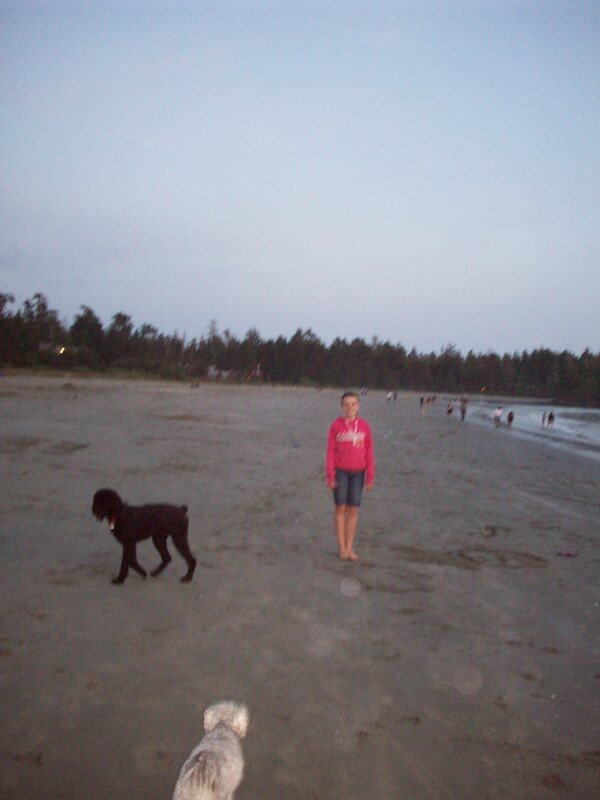 We headed over to Tofino from Vancouver and after getting off the ferry started the 3 hour drive from Nanaimo. One of the must stops on the trip is Coombs. It’s about 1/2 an hour from the ferry but you will know you are there by the crowds of people and the famous goats grazing on the market’s roof top. We stopped there for ice cream and picked up some local fruits, vegetables and homemade bread. Off we went to Tofino. When we arrived at Bella Pacifica our first night was in a terrace site but not one with a view. We were to move into a view site for our 2nd and 3rd nights. The move was one of the memorable points. The terrace area is very open with no trees to maneuver around so we just loaded up our stuff and hooked up the tent trailer, and while still popped up,we pulled it all over to the new site. Day one we headed into Tofino to look around the shops and book the tours we wanted. 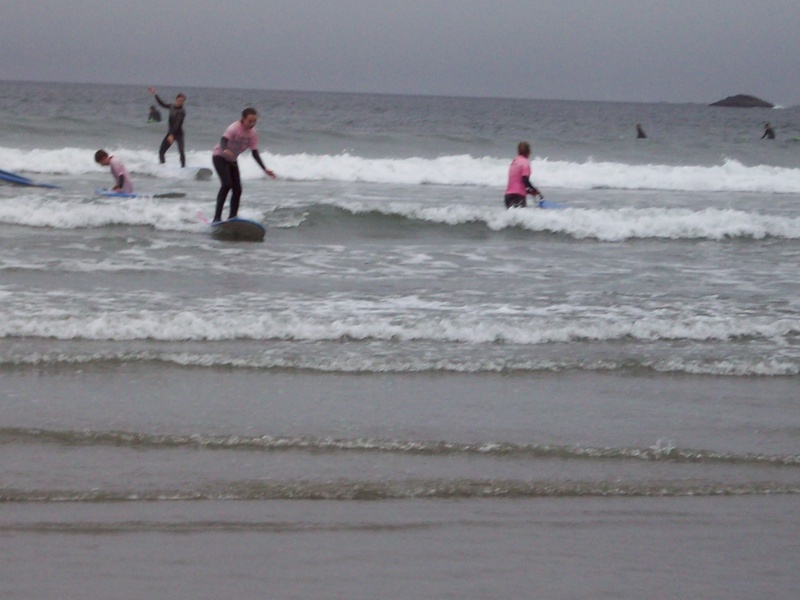 The kids really wanted to surf so our first goal was getting them surf lessons. We choose Surf Sisters but there are several surf companies that you can use. We spent that morning poking through the shops and then returned to the campsite for the afternoon. 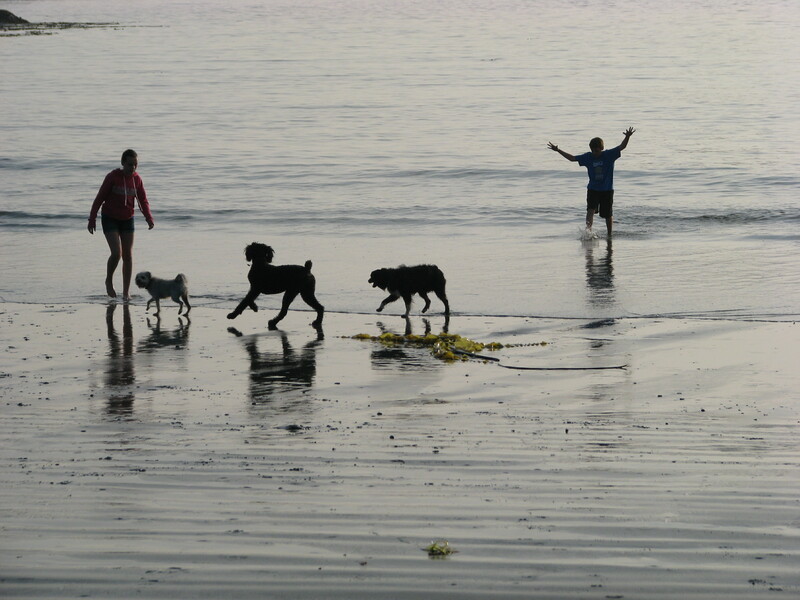 The entire afternoon and evening were spent on the beach. We walked for miles, climbed rocks, collected shells and played in the water. The hours flew by and the afternoon was very relaxing. The second morning we got up and made the big move into our new campsite with an ocean view. It was amazing! After we were settled we headed over to Surf Sisters and got the kids suited up and ready for their surf lessons. The kids had tons of fun learning to surf and by then end of the lesson they were able to get up on the boards. I would recommend lesson if it is your first time because the beaches are packed with surfers and it helps to know which beaches are best for beginners and what the basic surfing etiquette is for your own safety and the safety of the other surfers. Surfing had been so much fun that we decided to rent boards for our last full day. We spent hours in the water and with the wet suits you really didn’t get cold. 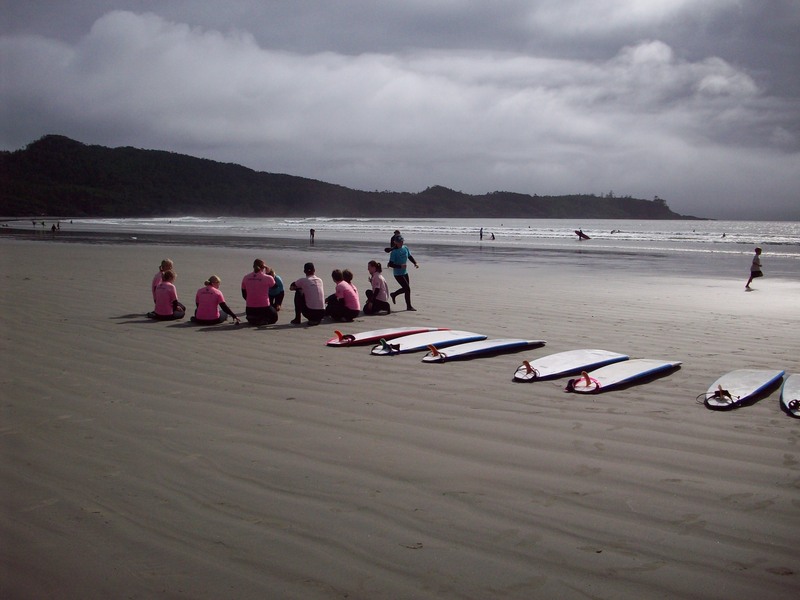 Something to keep in mind if you are heading to Tofino with surfing as your main goal: many of the surf rental will not give campers a multi-day surf board rental because camping is not secure enough for the boards to be stored. After a day surfing we stopped at a crab shack on the way home. We bought 4 fresh crabs and for and extra $1.00 each they cleaned them and another $1.00 each they steamed them. That was the best $8.00 we could have spent. Once back at the campsite we sat down for our dinner of fresh crab, local wine and an amazing view. This trip we did not have time to fit in whale watching but on a previous trip my husband and I had taken a grey whale watching tour. It was spectacular to see these majestic mammals up close and I would highly recommend a whale watching tour to anyone who is making the trip to Tofino. The other activity we did not do this trip was kayaking. There are several kayaking tours depending on your experience but an evening tour at sunset is a fantastic way to enjoy the view and the serenity of the area. Tofino really is a must-do vacation spot for any visitor to BC and camping at Bella Pacifica really did add to the experience. ← Hammock Chair for your Trailer Hitch! This very well written and informative. I love that you list things to do while visiting. You took the time to check out all the camp sites and see which ones were best. The pictures are great too. Really I think you’ve covered it all and done an amazing job! Love the details on this post! 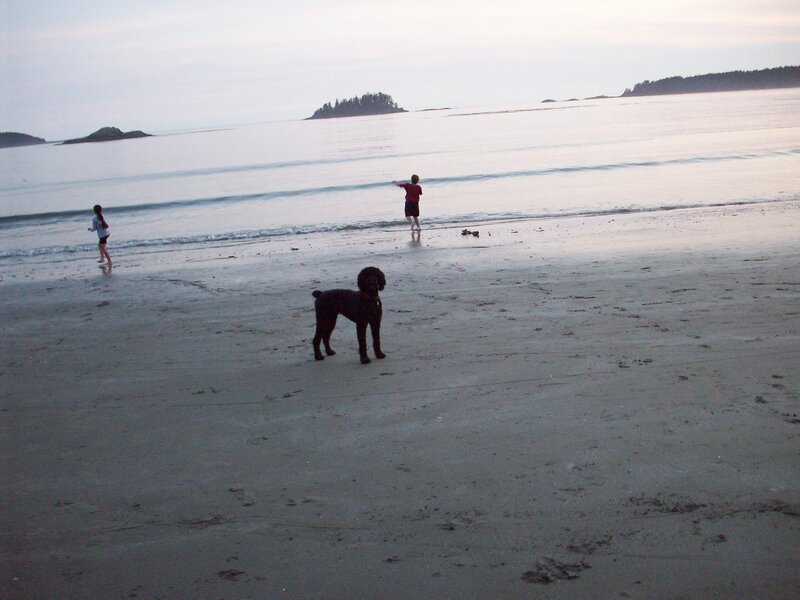 We are heading to Tofino next month and booked at Bella Pacifica, would you remember which Beachfront site you got? We have #4 and was wondering if the privacy is really bad like the reviews say? Thanks! We were only able to get a beach view site in the terrace but would have loved a beachfront site. Yes these sites are small and as a general rule they are very close together but if you have camped in private campgrounds in the past you won’t be surprised by that. The beach front do have brush between them but are open on the front to the ocean. Go into your trip excited about the view, take a tarp to hang for privacy on the side but if you position your vehicles right you will be fine. You have booked it, it’s ocean front and the beach is amazing. I would recommend stop reading reviews, they are always the negative people who post them. What you give up in privacy you more than make up for in view and access to the beach. If you could post a comment or send me your thoughts when you are back I would love to have your thought on my site. Have fun and don’t worry.